Why choose Nuffield Health Chester, The Grosvenor Hospital for my knee replacement surgery? At our Nuffield Health Hospital in Chester we've been providing outstanding private healthcare for over 40 years. From your initial knee consultation, your dedicated consultant will support you throughout the treatment process. Our team of matron-led nurses will make sure your stay with us is as comfortable as possible. 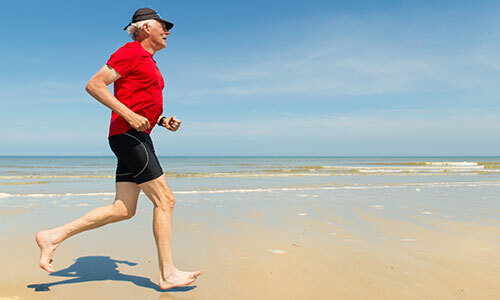 Recovery will play an important part in the success of your knee replacement surgery. That's why we have an on-site gym where you will receive physiotherapy treatment to aid your speedy recovery. Over time, the surfaces on the knee joint can start to wear. This can be caused by arthritis (a group of conditions that cause damage to one or more joints) or a previous injury to the knee. Arthritis is painful as joints become stiff and inflamed when the smooth lining between the joints gets damaged or wears away. Without the protection of this lining, the rough surfaces of your bones rub together as you move, causing the pain that is all too common to sufferers. A knee replacement is a procedure to remove your damaged knee joint and replace it with an artificial one (a prosthesis or implant) – this is made out of metal, plastic or ceramic. Following your surgery your knee should be much less painful and the joint should move more smoothly. New advances in technology offer a greater range of implant types and sizes. Your surgeon will choose the implant that best fits your body size and lifestyle. In some cases a CT scan or MRI scan of your knee may be used to create special guides that will help your surgeon accurately fit your prosthesis. A knee replacement is normally performed under general anaesthetic. During the operation your whole existing knee joint is replaced with a new prosthetic knee joint. This takes between one and two hours. Your surgeon will make an incision (cut) at the front of your Knee Replacementknee where the replacement will be inserted. Usually, you will stay in hospital for 2-4 days, but you may have to stay longer if necessary. We understand that you may be anxious or worried about getting up, but we will do all we can to help and reassure you. A member of our Healthcare Team will be there to help you, whenever you are ready. The reason for getting you moving is to improve your circulation and avoid stiffness. You may be feeling tender and sore, but you can get pain relief medication to deal with any discomfort – just ask one of the nurses if you have any pain. Once out of bed, you will continue to wear support stockings to help your circulation. The physiotherapists will work with you during your stay to help give you the best start with your new joint. Before discharge you will have an X-ray of your new knee to check its position. We will do all we can to help and reassure you.